NEW YORK — Monday was Veterans Day in the United States. It’s a time to honor and celebrate all those in the military who have fought in America’s wars. An estimated 25,000 people marched in the annual Veterans Day Parade in New York City. The parade got off to a solemn start at a ceremony to honor fallen veterans. Afterward, retired Army Lieutenant Colonel Dwight Webster, a 31-year veteran who last saw active duty in Iraq, said this national holiday is not only about the past. Another vet was a machine gunner in the Korean conflict during the early 1950s, when he was awarded a Purple Heart and a Bronze Star medal. He feels lucky to have survived the horrors he saw. “… and I am here today joining the parade. It’s a blessing," he said. Arnold Strauch, who fought during World War II, says that to be brave during war is also to know fear. "All of us were at one time or another were pretty frightened of what we were doing," he said. "But fortunately, the people I was closest to made it through the war." The parade was full of music and thunder, as bagpipers joined motorcycle clubs for vets along the route. Vietnam War veteran Frank Mulholland, a biker with the ‘Nam Knights, says he respects veterans of every era. Mort Gerard, who fought in Korea, feels an especially powerful bond with other Marines. 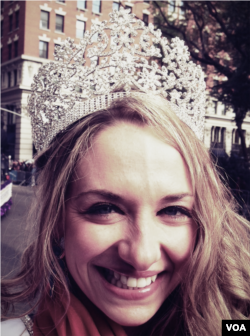 This year’s parade focused especially on returning female veterans, 35,000 of whom are homeless at any one time, according to active duty Army Sergeant Allaina Guitron, who was crowned Ms. Veteran America to raise awareness about their suffering. Onlooker Roberta William helps run a university program for returning veterans. She says giving back to those who have given America so much is deeply meaningful. Thoughts for every American on this Veterans Day 2013.